Do GrassrootsHealth participants change their vitamin D status and supplement use after their first test? GrassrootHealth believes that the key to moving research into practice is to equip individuals with the knowledge needed to take charge of their own health. By providing people with information about the health benefits of achieving a vitamin D level of at least 40 ng/ml, and the ability to find out their vitamin D level though home blood spot testing, we believe that people can be empowered to improve their health and help prevent disease. Today, we will provide a summary of what changes GrassrootsHealth participants make after they receive the results of their first test. 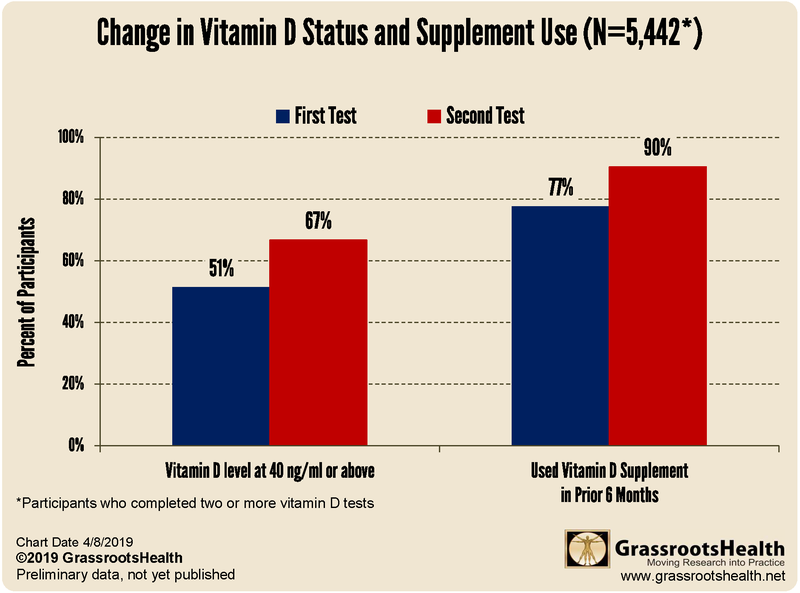 Among 5,442 GrassrootsHealth participants who completed at least two vitamin D tests, the chart below shows that approximately half (51%) achieved 40 ng/ml on their first test compared to two-thirds (67%) on their second test. Also, 77% reported using a vitamin D supplement on their first test, which increased to 90% on their second test. Additionally, the median vitamin D supplement intake amount increased from 2000 IU/day on the first test to 4000 IU/day on the second test. Among those who were less than 40 ng/ml on their first test, a majority increased their supplemental intake amount (76%) and their vitamin D level (81%) between their first and second tests. This data shows that when individuals are provided with the information and tools to take charge of their health, they make changes aimed at improving their health and reducing disease risk. Find out your vitamin D levels today!